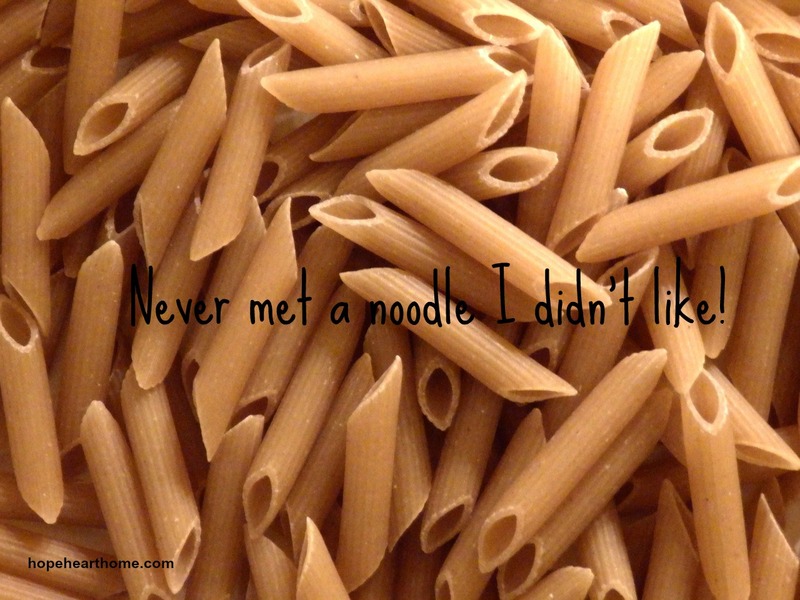 Hubs and I have this saying, “We’ve never met a noodle we didn’t like!” Yes, we love pasta; however, about two years ago we began eliminating gluten from our diet. Neither one of us have Celiac Disease, we became convicted that wheat was not a wise choice for us. For bread lovers, this was hard but doable. And, do it, we did! We do mess up and we are not dogmatic about it – if we have any say over the food that is about to land in our mouths, we say no to gluten! Today’s market has a myriad of options in the G-free arena. I love Trader Joe’s gluten free pasta – the spirals, the elbows, the penne – ALL good, and I keep a lot of it on-hand. Today’s “tasty” is from the carnivore section of my favorite recipes binder – we love to eat vegetarian but also enjoy organic beef and chicken a couple times a week. I’m sure tofu would make a great substitute to the chicken. Let me know how you like this! Cook pasta according to package directions in lightly salted water; drain and set aside. Cut chicken breasts into chunks and sprinkle with salt & pepper. Heat butter and oil over high heat in a large skillet. Add chicken chunks in a single layer and do not stir for a minute or two in order to allow the chicken to brown on the first side. Turn the chicken and brown on the other side. Cook until done, then remove chicken from the skillet. Turn off the heat. Add spinach, tomatoes, chicken, and cooked pasta to the skillet. Toss to combine, the spinach will wilt as you toss everything. Add plenty of Parmesan and toss to combine. Serve with extra cheese. 6-8 servings. I went to Aldie’s in Hickory last week. They had a boat load of gluten free items including pasta. Organic ground beef 6.99 a lb. Organic baby kale and more. Prices very good. I always thought Trader Joes was a little high. Big Lots has a lot when you are there at the right time. I got Quinoa pasta the last time I was there. They always have Bob’s Red Mill products. You know I am a bargain hunter. Of course Aldie’s had the gluten free junk food chocolate covered pretzels and chips. Although I did get a bag of veggie chips all root veggies and they were really good, chips are my weakness. I will try the recipe and let you know although we are not big pasta fans. I know that Aldi’s is really getting good about the g-free products and some organic meats. YAY!!! I think TJ’s is fairly-priced – compared to Earth Fare rip-off’s!!!!!!!!!!! I’m not sure I trust folks who aren’t noodle-lovers. LOL!!! No wonder you and my mom were bestie’s!!! I agree about Earth Fare. Where do you go to TJ’s? Have never tried gluten free “anything” because the carbs are the same. When we eat pasta it is Dreamfield’s low carb which is not gluten free. I don’t THINK I have a problem with gluten (I avoid carbs….not perfectly…..but, pretty much because of diabetes)…….having said all of that…….this recipe sounds really, really tasty and if I had my feet under your dinner table I would definitely have some and enjoy it for SURE! You’re such a disciplined person, Susan, and I admire that highly. Love ya! Another great round of Tasty Tuesday! I had pasta last night and the night before so it’s safe to say I would probably like this. OOooooh – this looks so good! I’m gonna print it out and add it to the menu in the next week or two! Yum! K – it won’t disappoint! Running to the grocery store on my way to pick up the boys from school… It’s noodles for dinner! I ma trying to stay away from flour and sugar these days but have fallen of the bandwagon because BREAD and PASTA and CHOCOLATE. I love how a good pasta meal fills up all these men I have to feed. I bet I could whip this up for them and then just put my portion over some roasted squash or veggies! I love your Tasty Tuesday recipes. IT WOULD BE AWESOME COLLEEN. How about those noodles you make by “shredding” zucchini? Or spaghetti squash? I love pasta too! This looks so yummy. Kudos to you for going gluten free. I don’t think I ever could…or if I did my family night disown me since we plant wheat etc. Tara, be brave and don’t tell them! Your stomach will love you! Erin, LMK how you like it!! !